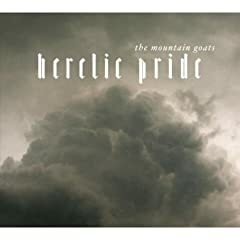 The new Mountain Goats album, Heretic Pride, is garnering critical accolades (including an 8.0 in Pitchfork today), all of them deserved. Not only is John Darnielle's songwriting stronger with every new release, but he seems more comfortable with the production and collaborating musicians (including St. Vincent's Annie Clark here). Look for an interview with Darnielle on Largehearted Boy tomorrow. A Mountain Goats release alone would make it a great music release week for me, but there are plenty more quality discs I can recommend. Bon Iver received plenty of music blog love for the hauntingly beautiful For Emma, Forever Ago. I can also strongly recommend American Music Club's The Golden Age, Allison Moorer's Mockingbird, Flowers Forever's self-titled debut, Headlights' Some Racing, Some Stopping, Mike Doughty's Golden Delicious, Raveonettes' Lust Lust Lust, and Throw Me the Statue's Moonbeams from what I have already heard. Yep Roc reissues a remastered edition of Nick Lowe's classic album, Jesus of Cool, this week. Poetry and Beat generation fans will be excited to see Jack Kerouac & Steve Allen's three-disc Poetry For The Beat Generation available as a standalone purchase.